Pat Hobby, the forty-nine year old screenwriter, is back. Richard Foreman brings F. Scott Fitzgerald’s comic creation back to life – his cynicism, alcoholism and bad luck – in a collection of wonderfully funny and melancholy short stories. Foreman, the acclaimed author of the Raffles series of books, injects his trademark dry wit and surprise twists into each story, whilst honouring the spirit of Fitzgerald’s original sketches. The Complete Pat Hobby includes the following stories. 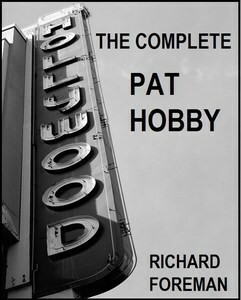 Pat Hobby has been commissioned to re-write a classic film script, one that he worked on in the past. If Pat can turn around the script in time he might then be able to turn his fortunes around. But fortune favours the brave, rather than the inept. It’s the day of the big race and Pat Hobby needs to pick the right horse, not least because he needs to pay off his bar tab at Malley’s Tavern. Pat meets Sally, an attractive and lucky tipster. Will Pat win the race and the girl? “The lunatics have taken over the asylum,” the veteran director Frank Bradman exclaims, as forty-nine year old screenwriter Pat Hobby is given a part as an extra in a movie. Pat has just one line to deliver, in his role as a drunk. But unfortunately Pat may be taking his role too seriously. Europe is at war, but Pat Hobby’s current battle is to convince the British actor Nigel Chester to sign up to a career in Hollywood. The two men find an ally in each other, but how much will Pat prove to be his own worst enemy again? Patrick Bishop, author of Fighter Boys and A Good War. Richard Foreman is the author of numerous best-selling Kindle books, including Augustus: Son of Rome and the Raffles series of historical crime novellas. He is also the author of Warsaw, a literary novel set during the end of the Second World War. He lives in London.